New York—Pope Benedict XVI shared a message of faith and hope in Jesus, the Church and young people when he spoke to the youth and seminarian rally on April 19 at St. Joseph’s Seminary in Yonkers, N.Y.
A crowd of 25,000—including 44 youths and six chaperones from the Archdiocese of Indianapolis—listened attentively to the special message. Yet he also acknowledged dangers in society. He tried to connect with the thousands of young people in attendance by reflecting on his life growing up in Nazi Germany. “My own years as a teenager were marred by a sinister regime that thought it had all the answers,” Pope Benedict said. He expanded on the darkness of society and split the areas of darkness into two groups. The first group is society’s “culture of death.” He called for people to work for the dignity of every human being, born or unborn. Pope Benedict also warned that this darkness lives in the mind through temptations and distorted thoughts. The pope said we can avoid these areas of darkness through four related elements: prayer, the liturgy, charity and religious vocations. A key point to the focus on prayer covered by Pope Benedict is the element of silent prayer. 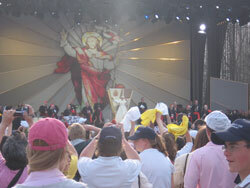 Believers must first develop a strong personal relationship with God, Pope Benedict said. Then, and only then, God will hear the call, and people have to be ready to listen. Adding to that message, the Holy Father said that prayer and hope are directly related and interchangeable. Kaleb Bramer, 16, of St. Gabriel Parish in Connersville, thought Pope Benedict did a good job of reaching the various groups of people present at the rally. Kaleb felt a connection to the pope’s call for sacrifice and service as a way of bringing about God’s kingdom. Pope Benedict concluded his message to the youths and seminarians of America with a discussion of vocations in the Church. He called for all men and women to look to God for guidance in discerning their true vocation, whether that means holy orders, religious life or married life. The best way to discern a vocation, according to Pope Benedict, is a combination of prayer, service and participation in the liturgy. He offered this advice to any person who felt lost or unsure in their discernment.